For horses that are aiming towards the 2019 Grand National their entire season plan has to focus around that. They can’t run too many times before the gruelling test in April, as the horse needs to be fresh. Handicap marks also need to be protected. A horse needs to have a high enough mark to get into the race, but needs to have a mark they can win off to be competitive. Ms Parfois is only sevens year old and a mare. That makes it statistically difficult to win a Grand National. That said, her seasonal plan is going to be focused around a tilt at the Grand National this summer. As far as the distance goes, when we saw her last season it was very much a case of the further she goes, the better she is. She was seen to best effect when running in the four miler at Cheltenham. She showed so much stamina that tells us that the National trip will be no problem at all for her. She ran very well over trips around the three mile mark. On every occasion she stayed on very well and looked full of running towards the end of the race. This along with showing the speed to run well and win over three miles is something she simply must have if she wants to go close in the big one. Trained by Anthony Honeyball, we saw Ms Parfois seven times last season. In those chases she never finished outside of the top three. This is a remarkable achievement when you look at some of the races she ran in. Of those, she managed to win three, which all came in a row during the winter between December to January. She began life in a novice chase and was rated 127 going into that. She finished her season with a second place in a Grade One at Aintree. Running off mark of 146, she improved by nearly 20lbs. Her current mark would be good enough to get her in the National. If that is her aim then it will be interesting to see what kind of campaign she has, especially if they think she has improved over the summer even further. This wouldn’t be a surprise given that she is still on seven, there is plenty more to come. There is a chance that we could see her over hurdles to protect the handicap mark she has over fences and being rated just 127 over the smaller obstacles, she would be of huge interest in any race off that mark. Following her second place win at Aintree in the Mildmay Novices Chase in April 2018, trainer Honeyball said “Ms Parfois is a very good mare. I think we will aim her at the Welsh National next season. The future appears to be very bright for Ms Parfois and a tilt at the 2019 Grand National would be no surprise at all. She could have improved further over the summer and if that is the case, she could go close in the Aintree showpiece next April. Ante-post odds of 40/1 are currently available for Ms Parfois for the 2019 Grand National with Betfair! 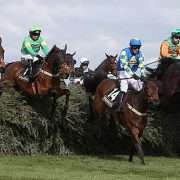 Can A Mare Win The 2019 Grand National?